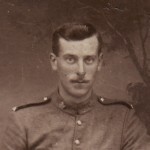 After Alfred Roskilly died, there was some confusion in the War Office as to whether he was killed in action on 3 May 1917 or died just over a month later as a prisoner of war. The authorities had received information via the International Red Cross, that an “A. 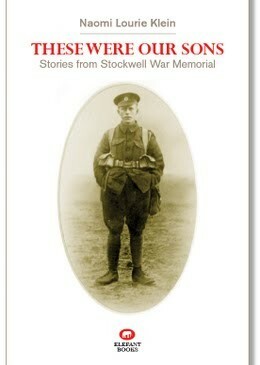 Rostkeilly” of the Royal West Surrey Regiment was held by the Germans. However, no real conclusion emerges from the files, except that, in the absence of real evidence, the Army accepted the earlier date as the date of death. The date of death was important as it affected the payments owing to the deceased, inherited by his widow. 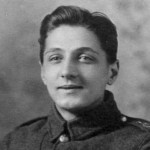 Roskilly, an assistant clerk in the Post Office Savings Bank at Blythe Road, West Kensington, had considerable military experience, having joined the 2nd (Cadet) Battalion of the London Regiment (Civil Service), moving to the 15th Battalion, and subsequently transferring to the London Field Ambulance on 9 July 1915. 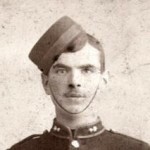 He served 1 year and 225 days before being granted a temporary commission in March 1917. He survived less than 10 weeks. 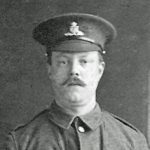 Arthur Roskilly, the eldest of four children of compositor Alfred Joseph Roskilly, from Dalston, east London, and Clara Roskilly, from Southampton. His military character was described as “very good.” He stood 5 feet 7½ inches, weighed 9¾ stone and had a 39-inch chest. 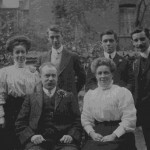 In 1911 the Roskilly family lived at 32 Clitheroe Road, Stockwell, where they occupied six rooms. Arthur married Ruth Lambert at St Anne’s and All Saints Church, South Lambeth Road on 2 April 1914. 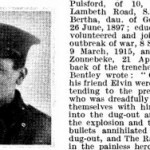 In 1911, Alfred Roskilly, the eldest child of compositor Alfred Joseph Roskilly, 41, from Dalston, east London, and Clara Roskilly, 42, from Southampton, was 20 and working as a civil service clerk. 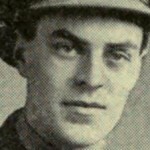 The couple had three other surviving children (one had died): Frank Roskilly, 19, a “boy clerk’, like Alfred born in Southwark; Doris Roskilly, 8, born in Stockwell; Ruby Roskilly, 6, born in Stockwell. A boarder, Henry Goerge Downer, 19 and from Cirencester, Gloucestershire, another boy clerk, lived with the family at 32 Clitheroe Road, Stockwell, where they had six rooms. A decade earlier, the Roskilly family lived at 16 Grantham Road.